Give Kids Money or Make 'Em Earn It? When your child starts asking for an allowance, it's up to you to decide whether or not they should earn the money. Parents go around and around on this topic: money (allowances) for kids. Should you give them money for chores done around the house? Or, are chores simply a part of family life? It’s debatable. It's only when your child starts hearing about how much money her friend at school gets (and for nothing) that she starts to ask where her money is. She wants to have a little spending cash on the weekends, too. But, it's up to you as to whether or not it's just an allowance or she has to earn it through chore completions. 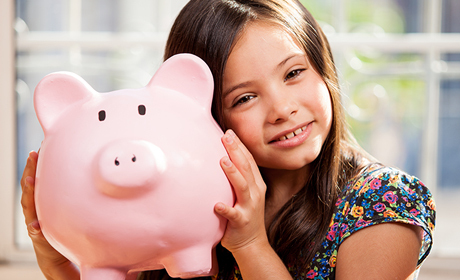 In the book, Put Yourself in Their Shoes, parenting expert and author Barbara Meltz says that early in grade school is a good time for a child to start learning about money by getting an allowance. But before you arbitrarily set a price, talk with your child about your expectations of what she should do with her earned money. Arrive together at what a good amount is. (If part of the teaching experience is to be about saving, the the allowance needs to be enough so that your child can put some aside.) Meltz suggests starting at $3 a week for a 7-year-old, and giving an allowance twice a month rather than weekly. "No allowance here," says local mom Lisa R Brown. "Regular chores must be done first (no money for these), then he can pick from extra chores to earn money. No one just gives me money. He also has to pay for anything extra he wants." Personal finance expert Dave Ramsey says a commission may work better than an allowance — to pay by the job. For instance, if your child helps with laundry, pay her .50 cents. You can post a list of jobs your child needs to complete throughout the week with the amount stipulated for the job. By the end of the week, add up how much she earns based on jobs completed. Ramsey says this approach helps kids get on board with new things that need doing quicker than you may realize! "We give our kids an allowance and then if they don't fulfill their stated (and printed out) responsibilities, they can lose money," says local mom Alissa Beuerlein. "From studies we've seen this works well and has worked well for our boys! It's a pretty good motivator. We also don't buy them toys or things they want unless it's Christmas or birthday, so they save up for things they want with their allowance. This gives them some sense of responsibility with money," she adds. But, how much do you give a child? Local mom Tammy Worley Holloman says she has a good system in place. "Our 12-year-old earns $12 a week ($1 for each year)," says Holloman. "That's for chores such as taking out the trash, doing dishes and doing his laundry. Since we just started it, we may make adjustments. He's our one and only, so we're learning along the way," she adds. The decision is made. Your child now can have an allowance or earn it by doing chores. Now, it's time to decide how to hand that money over. One parent suggested using a prepaid credit card. It was her choice seeming how her child like to shop online. However, local parents are not keen on the idea. "How about actually taking her to a physical store instead of shoving another electronic device in front of her?" asks local mom Amber Vanderline. "Teach her to go out and do things for herself. Not everything needs to be delivered to the door." She says her son gets an allowance, but she takes him shopping when he wants to go. "It sickens me that you can now have Alexa read your child a bedtime story! Parents are really getting lazy and detached from doing things like that for their children. It's incredibly sad," adds Vanderline. However, local mom Jill Crigger Perryman disagrees. "My 12-year-old and I hate shopping," says Perryman. "Online shopping is a win for us. It's not about being lazy — it's about being overwhelmed. We sit together, look and shop. It takes 30 minutes, and that leaves lots more time for other things we actually enjoy," she adds. Other parents suggest you put the money into a checking account for her. Maybe a big piggy bank is all you need.